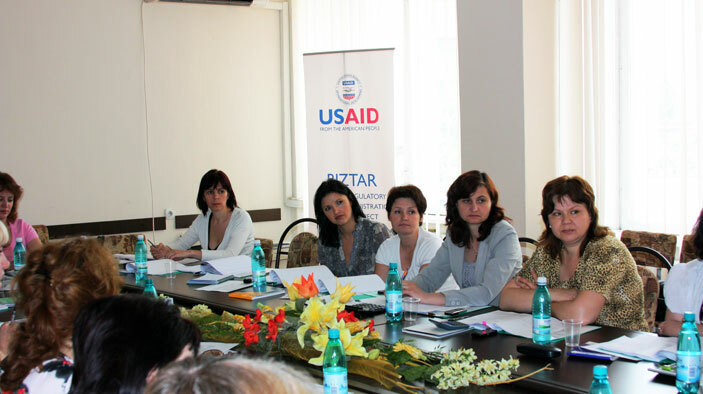 BIZTAR supported the Government of Moldova’s efforts to encourage productive investment by improving the business environment and lowering the overall burden of state regulation on private enterprise. The project focused on streamlining business-state interaction through regulatory reform and promoting more efficient administrative procedures to ensure that reporting requirements for tax and other business purposes are kept to the minimum needed for effective government operations. Over the four-year lifespan of the project, three of Moldova’s World Bank Doing Business indicators saw significant improvement: Starting a Business, Ending a Business, and Paying Taxes. The Paying Taxes indicator moved from 119th in the world (2008) to 81st (2012). By 2012, Moldova was among the top 10 reformers in the world, jumping from 99th to 81st place and ranking as the second most-improved country in the world. BIZTAR has been recognized as one of the key contributors to the country’s strong performance in the Doing Business report. Improve and simplify business licensing procedures and business and tax reporting requirements. Improve access to government information. Monitor reform and public awareness. Improve taxpayer services and tax appeal processes, and help prevent tax fraud. Dramatically reduced the cost and difficulty of starting a new business. In 2007, this process required 10 different procedures and took 30 days to complete. By 2011, this was reduced to seven procedures and nine days. Redrafted or deleted 275 business laws and regulations, increasing transparency and reducing the number of inspections and filing requirements imposed on businesses. Developed software that allows individuals and organizations to file taxes online (used by nearly 30,000 Moldovan businesses); file social security returns online; generate and print a certificate of tax payment; register a new business without making a separate trip to the Social Security office; and look up the acts issued by Moldovan local public authorities from anywhere on the Internet. Drafted or helped draft critical laws, including a law on construction (2010); law on the Guillotine 2+ (2011), which consolidates thousands of pages of regulations affecting businesses into a single, short, clear document; law on one-stop shops (2011), which will revive the moribund one-stop shop system; and law on protecting investors (2011), which should move Moldova 10–12 ranks in next year’s Doing Business survey. Published more than 30 studies and assessments on a wide range of business and tax-related topics, from bankruptcy in Moldova to the state of the Moldovan meat market.